For only the second time in DCI's history, all corps at the 1980 World Championship Finals in Birmingham, Ala. had been previous finalists. The contest witnessed the smallest spread ever between first and fourth place, just eight tenths of a point. With a different judging system in place than is used today, Blue Devils' winning score of 90.60 would only have been good enough for seventh place in 2012, and Cavaliers' 77.40—the lowest ninth place score ever—would have only been good enough for 20th. 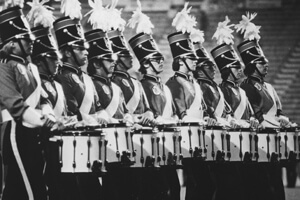 1980 was the year when the east could easily have won its first DCI title, and days before the Birmingham shows, the second place 27th Lancers beat the Blue Devils at the DCI East Prelims and Finals. The corps entered the season basking in the glow of its worldwide television exposure at the opening and closing ceremonies of the 1980 Winter Olympics in Lake Placid. Another notable placement was the Blue Stars dropping out of Finals by one position, not to be seen again in the Saturday evening show until 2008 and leaving Santa Clara Vanguard as the only corps to be in every Finals. It's a distinction SCV has maintained throughout DCI's four-decade history. The 12th place finish by Guardsmen would be the last year drum corps fans saw the corps in Finals. Just two years later, the four-time finalist would drop another 20 places. The show opened with Erich Korngold's "Sea Hawk," the theme music for the 1940 swashbuckling film starring Errol Flynn. From the beginning, fans generally commented on two things: The color guard, continually one of the top units in winter guard competition, was one of the hardest working units on the field. However, this was somewhat muted by the oft-criticized visual program, which often moved through somewhat static drill forms relatively slowly. The concert standstill was John LaBarbara's "Tiger of San Pedro," a hot dynamo written for jazz trombonist Bill Watrous and his Manhattan Wildlife Refuge Big Band. The title track of his 1975 album, the title referenced part of a Sherlock Holmes short story written by British author Arthur Conan Doyle. The piece was brought back from the corps' successful seventh-place season in 1979 and, like the rest of the horn book, was arranged by Tim Salzman before he went to instruct Santa Clara Vanguard and the Cavaliers. Discount DVD offer ends Monday, Oct. 22 at 8:30 a.m. ET.